It didn't surprise me at all. In the wake of recent terrorist actions and threats, three malls across the country were evacuated this weekend due to bomb threats. An empty suitcase caused the evacuation of some 500 people Saturday morning at a handful of stores at the Largo Mall, an outdoor outlet mall near Tampa, Florida. Then, a two-story shopping mall in Hackensack, New Jersey, was evacuated after authorities learned of a bomb threat scrawled on the wall of a bathroom. In Farmington, New Mexico, the Animas Valley Mall was cleared out and closed while police searched the shopping center after a threat was found on a women’s restroom wall. But malls weren't the only target. Police in San Francisco cleared a suspicious and unattended backpack, which was left on the Embarcadero, a tourist-heavy attraction near the city’s financial district. At the end of the day, all suspicious articles were cleared and shoppers were allowed to continue with their purchases. Were they serious threats, or just further attempts to keep this nation unbalanced and on edge? The fact that similar messages and threats were left on bathroom walls in local New Mexico schools would suggest the latter. We need to ask ourselves... what is the goal here? Were these part of a plan by ISIS and its sympathizers to create a hyper-vigilant state here in the US; to keep us nervous, anxious and insecure? And then after repeated "all clears", to create a false sense of safety, before carrying out another deadly attack? That certainly makes sense to me. 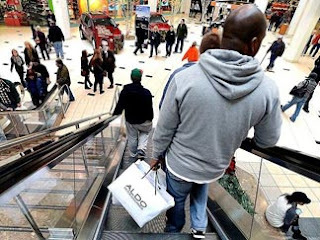 But at the same time, I do not doubt that one aspect of such schemes is to disrupt the economy of this nation, and convince shoppers to stay home during one of the busiest shopping seasons of the year. After all, an already weak economy would definitely suffer more if retailers failed to have a successful Christmas. Of course, all this is something that needs to be considered. But we must not forget the bigger picture; that there is a real design and strategy being carried out by the Enemy to bring the final battle of this world to fruition. Will the stated objectives of ISIS become a useful tool to precipitate that battle? Jessica Stern, a Research Professor at Boston University’s Pardee School of Global Studies presents a pretty convincing argument in her article, What Does ISIS Really Want Now? Although there is no mention of God, Satan, Battle of Armageddon or End of the World in her piece, those of us who believe in Jesus will see the parallels. Professor Stern cites Dabiq, ISIS’s on-line magazine, in which the terrorist state sets forth two principal but contradictory goals, which it labels “options.” The first is to spread a totalitarian caliphate throughout the region and, ultimately, the world. The second is to polarize Muslims against one another, to incite internal divisions within the West, and to turn the West against Islam, with the ultimate goal of “goad[ing] the West into launching an all-out ground attack, thereby setting the scene for the final battle between Muslims and the crusaders prophesized to be held at Dabiq in Syria.” Sounds like End Times to me! The first goal is evident in the Middle East, as Iraq and Syria are engulfed in battles with the self-proclaimed caliphate. We are now beginning to see the strategy for accomplishing the second goal. With the attacks in Europe, it has been easier to accomplish. The Muslim populations there are far more radicalized and willing to push the envelope, so to speak. But with the recent attack in San Bernardino, we can no longer deny that our homeland is subject to such blatant terrorism on behalf of ISIS. So the second option is coming into view and being put into action. We are only now seeing "moderate" Muslims begin to speak up and out against the radicalization of their faith, polarizing them against each other. And our societal discussion regarding "Islamaphobia" and discrimination versus tolerance is certainly causing internal division among our citizens. All it will take is another undisguised attack or two by ISIS supporters, and the West will turn against Islam, and their goal will be complete.... the final battle between the Muslims and "crusaders". Within the article, I found Professor Stern's explanation of ISIS's narrative to would-be jihadists quite fascinating. She states, "The narrative of victory most appeals to those who feel they have lost something. And ISIS deliberately appeals to disenfranchised Muslims, as well as to potential converts, around the world; to those—as ISIS puts it—“drowning in oceans of disgrace, being nursed on the milk of humiliation, and being ruled by the vilest of all people.” In one of the essays in its online magazine, ISIS urges its followers "to remove the garments of dishonor, and shake off the dust of humiliation and disgrace, for the era of lamenting and moaning has gone and the dawn of honor has emerged anew ... the sun of jihad has risen.” The author of that essay maintains that ISIS has established a true caliphate, with “honor and pride for the Muslim and humiliation and degradation for the kaffir.” The victory ISIS speaks of is the victory of the formerly oppressed. We might think that this would be an ineffective recruiting tool here in the U.S. After all, Sayed Farook of San Bernardino was born here in the U.S. and lived a comfortable American life. Yet he was still radicalized and poisoned by false ideologies fomented through his faith. Obviously, he was somehow convinced that he had been humiliated, and in order to find redemption and reclaim his self-respect, he needed to rise up against his oppressors in this country. That is an ideology that will be difficult for us to root out and eradicate because it has its foundation in a false belief as old as time. The Enemy of this world loves to whisper the lie that we humans are subject to unjust treatment; that there is no hope other than to follow his strategy to steal, kill, and destroy. It's the plan that he has worked since the moment he decided he could overthrow God. And he will use whatever, and whomever, he can recruit to cause as much damage to this world and God's kingdom as he can. His time is short -- that we know because the evidence is before us. 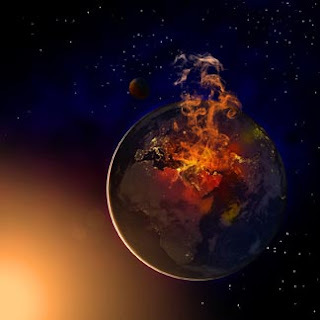 The players of the Bible's End Times prophecies are coming into view and the battle plan has been publicly announced. Will we be able to delay it with fervent prayer and repentance? That remains to be seen. But this I do know ... I see, very plainly, the opposing sides forming for this coming conflict. Satan and his army are lining up against Christ and His remnant. It is inevitable, and there will be victories and losses on both sides before the Final Battle. Now is the time for the peoples of the world to decide which side they are on, because believe me, they will be forced to choose. So all their preoccupation with the things of this world needs to take second place to their eternal future. I began this post by highlighting the largely unreported scares and potential terrorist attacks appearing around the country this last weekend. It was not my attention to create a buzzkill over the joyous atmosphere of this holiday season. But I strongly feel that we must all be alert to the Time in which we live; the prophetical Time forecast by our Savior, Himself. Recognize the signs and hear the clues being given by the enemies of Christ. Be vigilant and keep your eyes open as you keep them focused heavenward. ISIS is correct in one aspect of their goals ... Redemption is important ... but it is the redemption offered by the Saving Grace of Jesus Christ that will be our ultimate reward for following His true and righteous path. And make no mistake; Victory will be His! Deuteronomy 20:4 "For the Lord your God is He who goes with you to fight for you against your enemies, to give you the victory." Belle, We must stay vigilant on both the physical front as well as the spiritual front. I believe God will need warriors in every arena. God enjoys his partnership with man on both planes so we must be ready and willing to be of use. The muslim mind set is the same but caters to a false demon god who will always be a lesser god to the Most high God who created the principality "allah''. The time for amerikans to roll of their church pews and get with the schtick is now! The time to draw a line with sharia and false god worship is now. Learn to defend yourself and those who cant,learn spiritual warfare and putting on the full armor of God. The time is short so lets start acting like servants of the Kingdom and get engaged!!! We are definitely on the same page. I agree with every point you make and couldn't have said it better myself! It is encouraging to know that God has a remnant who think alike and clearly see what is coming. You're correct... now is the time to get engaged as a part of God's Kingdom. He wants to partner with us to usher in the return of our King, High Priest, Messiah, and Savior. Maranatha!